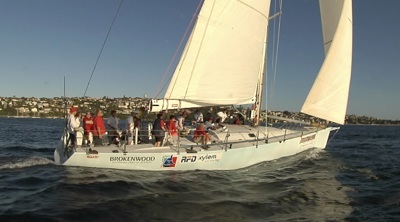 Since 2010, the Sailors With Disabilities (SWD) team has been racing the TP52, Wot Eva (the former Wot Yot, generously donated to SWD by wotif.com co-founder Graeme Wood). It was 47th overall and eighth in Division 1 of last year’s Hobart race and 21st overall in the 2014 Land Rover Sydney Gold Coast Yacht Race. Now Pescud returns to the Lyons 54 that he and a crew sailed to PHS overall victory in the tragic 1998 Sydney Hobart, which he repeated in the 2007 Hobart after winning PHS in the 2006 Sydney Mooloolaba race. In July 2003, with this yacht, Pescud and his crew with disabilities shattered the monohull circumnavigation of Australia record, which still holds today. For years, Pescud has been helping people with disability to develop a more optimistic outlook and enjoy personal growth. Close to 50,000 individuals have benefitted from the various programs this charity conducts. One of SWD’s high-profile success stories is Liesl Tesch, who after contesting her first Hobart race with SWD, went on to win gold at the 2012 Paralympic Games in the SKUD 18. Tesch and her skipper, Dan Fitzgibbon have won state, national and world titles, reaping countless awards and accolades for their successes.